Wanna mix and match? Well now is your chance! Purchase this adorable swim top and pair it with another swim skirt! Belt is not included. It's made with a very high quality designer, Lycra Spandex (swimsuit fabric.) Another great plus about our swimwear is they dry so quickly! Don’t you hate wearing cotton dresses to the beach and having to wait 2-3 hours to dry off? Completely in love with this!! Have always made my own swim shirts/shirts but decided to buy this one since I loved it so much and will be taking it on my honeymoon. I'd of never thought of lining it with the netting so it doesn't cling! It's amazing!! I am 5'10 and purchased the Miss Priss top in a 3x and skirt in a 2x. If, you are tall like me or taller the top goes to the waist. I am going to add extra length to the bottom of the shirt. The skirt went to the knee. I also ordered the swimming shorts went to the knee also. they are sooooo comfortable and can't wait to order another pair! Hope this is helpful for my tall beautiful sisters in Christ. I love my swim dress, its perfect for really hot summer days, on the lake, the pool, and its super cute. I've gotten lots of compliments on it, while at the lake. LOVE IT! I absolutely love this top!! I wore it to church last night, and when my Granddaughter saw me she said "Grandma, you look beautiful in that top!" 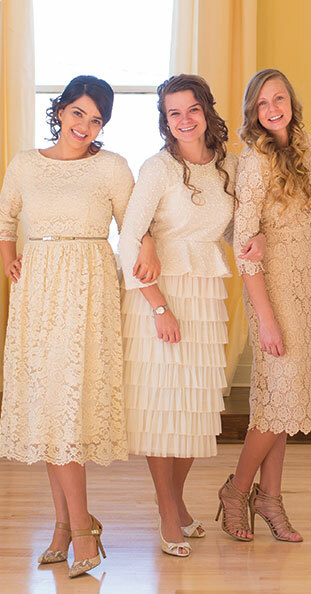 Please Dainty Jewell's make the skirt in 27-28" length!!! It is so gorgeous I will wear it anyplace I go. I am very pleased with my purchase!! It looks super cute with my matching Miss Priss Skirt too. Very comfortable and very modest! So glad I purchased both!! The Miss Priss swim top fits very true to size with the measurements on the site. The shorter sleeve goes to the middle of my upper arm, between my shoulder and elbow. Love this swim suit!